In February 2010, Parade the Circle Artistic Director Robin Van Lear was in Trinidad and Tobago working with carnival artists to create costumes for Parade the Circle when Stéphane Meppiel introduced himself. Affiliated with Les Grandes Personnes of Aubervilliers, France, a collective formed in 1998 to create sculptures that can perform in the streets, Stéphane was on his way home from Surinam. 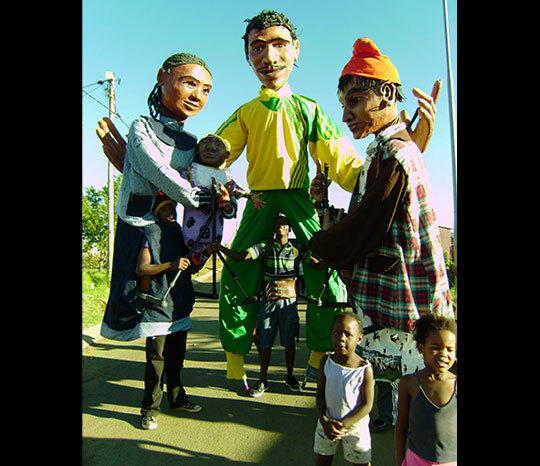 As they shared images of their giant puppets, Robin learned of Les Grandes Personnes’ connection to artists in both Burkina Faso and South Africa. Romeo and Juliet with a soccer twist. 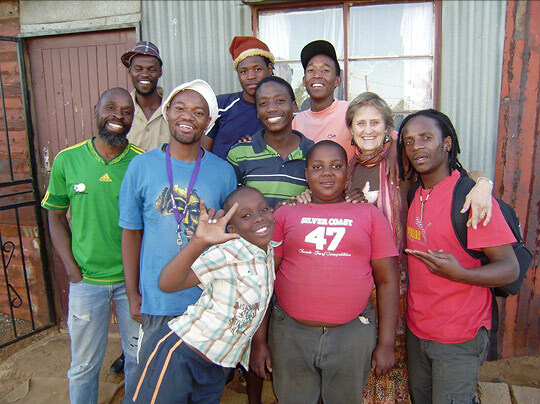 When she began preparing for her trip to South Africa in search of artists for Parade 2011, Les Grandes Personnes became her guide. In October 2010, Robin met three artists from Johannesburg townships who had each played pivotal roles in The Giant Match. 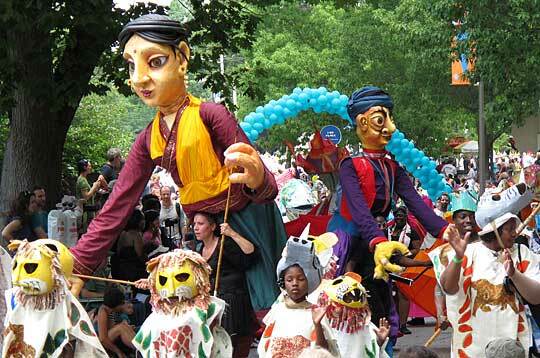 This international artistic collaboration, timed to coincide with the World Cup in July 2010, created an African Romeo and Juliet with a soccer twist brought to life by 30 giant puppets. In February 2011 Les Grandes Personnes artists were back in Burkina Faso where their team met Abdoulaye Ouedraogo, one of the 2010 Parade the Circle guest artists. beside Robin) came to Cleveland. The 22nd annual Parade the Circle welcomed its most international collaboration yet: six artists (three South African, two French, and one Burkinabe) combined talents. In celebration of the exhibition The Art of Daily Life, these six artists spent the three weeks prior to Parade at outreach sites throughout greater Cleveland demonstrating their techniques and leading performance rehearsals. They were also in residence at our CMA workshop tent where they constructed three giant puppets to join the throng of Cleveland creations. The resulting ensemble Shakuntala and the Ring of Recollection, inspired by the ancient Indian story and the exhibition Indian Kalighat Paintings, integrated the talents of the guest artists with those of Cleveland artists and participants from three Cleveland cultural institutions: Cleveland School of the Arts Theatre Department, Karamu House, and Cleveland Public Theatre Brick City at Lakeview Terrace Community Center (Cleveland Metropolitan Housing Authority). Giant puppets of the lovely maiden Shukuntala and the angry sage Durvasa enact the story of love discovered, frustrated, and triumphant, accompanied by animals from Karamu House, created under the direction of parade outreach artist Hector Castellanos.